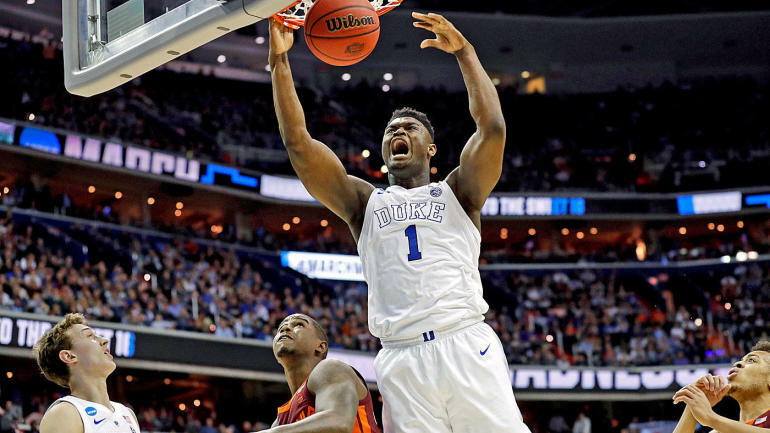 Zion Williamson made official on Monday what everybody has known since the opening night of this college basketball season – that he’s entering the 2019 NBA Draft. Now who’s going to be lucky enough to land him? Make no make mistake, the one-and-done prospect from Duke is the biggest prize available in this draft – a potential franchise-changer who will enter the league already a superstar. That’s the result of Williamson averaging 22.6 points, 8.9 rebounds, 2.1 assists, 2.1 steals and 1.8 blocks in 30.0 minutes per game this season while earning CBS Sports National Player of the Year honors. He might not be an All-Star as a rookie, if only because that’s a high bar to set for any teenager. But Williamson will immediately sell tickets, sell jerseys and get some franchise on national television way more often than it otherwise would be on national television. It’s impossible to overstate his appeal to casual fans. The Knicks, Cavaliers and Suns each have a 14.0 percent chance, which doubles as the best chance, of landing Williamson when the lottery is conducted May 14 – but the Sixers, Lakers, Bulls, Hawks, Wizards, Pelicans, Grizzlies, Timberwolves, Hornets and Heat are also possible destinations. So good luck, everybody. Winning the lottery doesn’t always allow a franchise to reinvent itself overnight. But winning this lottery will do exactly that.